Michael talks to Steve Greene about his extensive hosta collection. Shade can be one of gardening's greatest puzzles, and many people have come to think of hostas as a hardy, if slightly boring, solution. 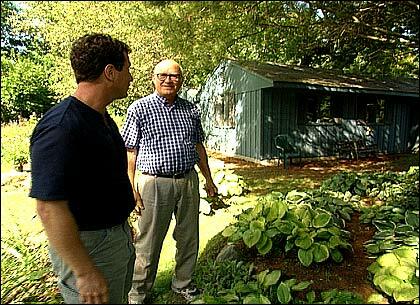 But as Steve Greene showed us in his own extensive gardens in Sudbury, Massachusetts  with over 200 different varieties!  today's hostas are not your father's Oldsmobile ... or however that goes. 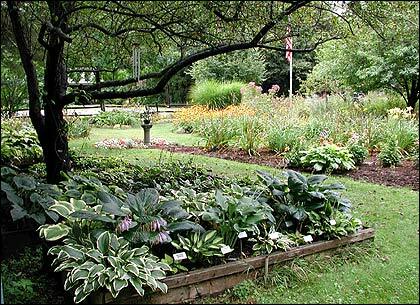 Steve grows more than 200 varieties of hosta. Brought to Europe in the late 18th century from Japan, Korea and China, and finally making their way to the Americas, hostas underwent a major process of hybridization over the past 40 to 50 years. Modern hosta varieties offer a bit of everything. There's both large and small, and all manner of variegated and complexly textured foliage. There are now miniature varieties available that do well in raised beds or urban settings where space is tight. And although hostas aren't known for it, some varieties even yield pretty flowers during part of the season. Versatility is another of hostas' attractive features. Although they are a reliable standby for shady places, hostas can also take some dappled sun, which Steve says helps them grow quickly and also brings out a nice gold tint in the foliage. But be patient: hostas develop some of their more attractive qualities with age, such as "seersuckering" and crinkling on the leaves, not to mention size. Steve demonstrates how to divide the root clump to create multiple viable plants. Most varieties of hosta can live for years without being divided, but they can also tend to overgrow their original site eventually. 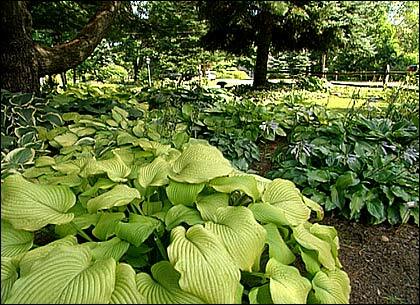 So in general, hostas do benefit when you divide them occasionally. Unlike some plants, when handled with relative care, hostas are resilient enough to survive the process pretty much any time of the year. To do this, remove the entire hosta from the ground with a spade or shovel and shake or rinse most of the soil from the roots. Then use a knife to make a division in the root clump; if you like, you can divide further by pulling smaller sections away with your hands. 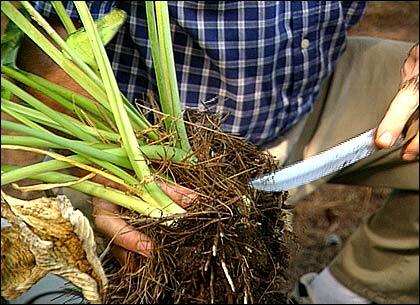 Transplant your divisions into soil enriched with fertilizer and some organic matter, then water them in thoroughly. If transplanting in the fall, it's especially important to use mulch to encourage adequate rooting before the ground freezes. Different hosta varieties offer a range of colors, shapes and textures. If you're in the market for some hostas, these varieties won the "Hosta of the Year" distinction from the American Hosta Growers Association in the years indicated. Same as or similar to 'Border Patrol,' this bluish-gray hosta has a creamy-white margin that varies in width. The plant is semi-upright with slightly undulating margins and a pale lavender bloom. Chartreuse with a dark green margin, 'Guacamole is folded and has some substance. This is the reverse variegated sport* of 'Fragrant Bouquet.' The plant will flourish with some direct sun and is one of the last to go dormant. Whitish bloom color with a fast growth rate. * "Sport" refers to a plant that shows a distinct, inheritable change from its parent; in other words, a mutation. For more information about hostas, visit the American Hosta Society online at www.hosta.org. This segment appears in show #2721.